Originally, for BMW, the M designation was created as part of their race car programme, however it soon became a badge associated with higher specification models of their standard road-going models. M-Power cars are renowned for their race-inspired modifications and to this day remain the performance car of choice for many who crave the excitement of driving, whilst retaining an outwardly understated demeanour. Successor to the highly successful M3, the M4 is somewhat less understated though, with a sporty, elongated profile, air inlets at the front to cool the M drivetrain, Aero Curtain and Air Breather to add to the aerodynamically-optimised design. M features are visible in the M kidney grille with double slats, M side gills and distinctive M wing mirrors. The M4 weighs in at under 1,500kg – something of a record for BMW. Powered by a brand new 431hp ‘TwinPower Turbo’ straight six-cylinder petrol engine with seven-speed M Double Clutch Transmission with Drivelogic, the new M4 also features the M Servotronic, Active M Differential and Adaptive M suspension, all designed to provide the driver with an immersive, thrilling experience. 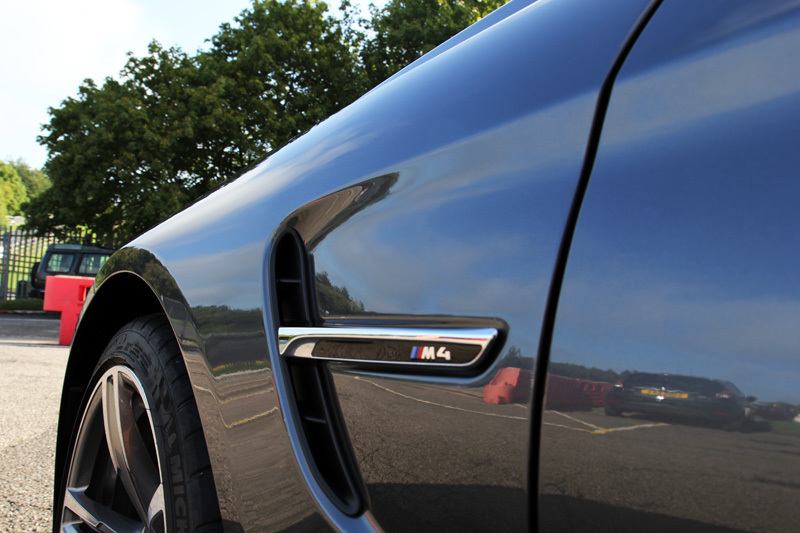 The M quad bevelled exhaust finishers emit the classic BMW M-Power sound guaranteed to set pulses racing. As BMW state: Technology driven. Adrenalin fuelled. The modifications and redesign have not been limited to just the exterior and performance of the M4. 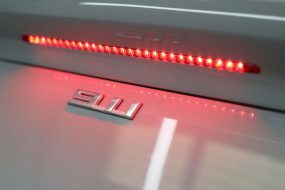 The interior has received some attention too: The M seats have been redeveloped with a shell shape and illuminated M logo. And of course all the control features in the cockpit are designed around the driver to enable seamless operation even during ‘dynamic’ driving. The carbon fibre trim and rounded instrument display gives the M4 that distinctive race car feel. 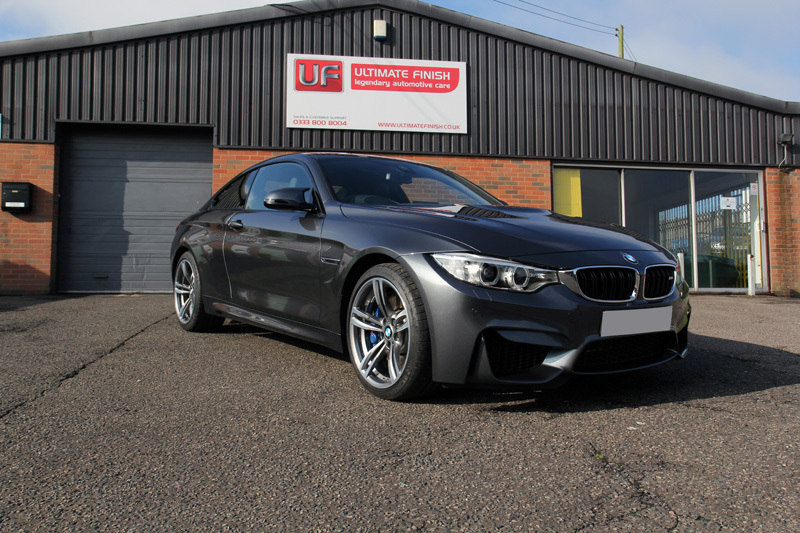 This M4 is the latest in the line of performance BMW’s to be worked on at UF’s Brands Hatch based Detailing Studio. 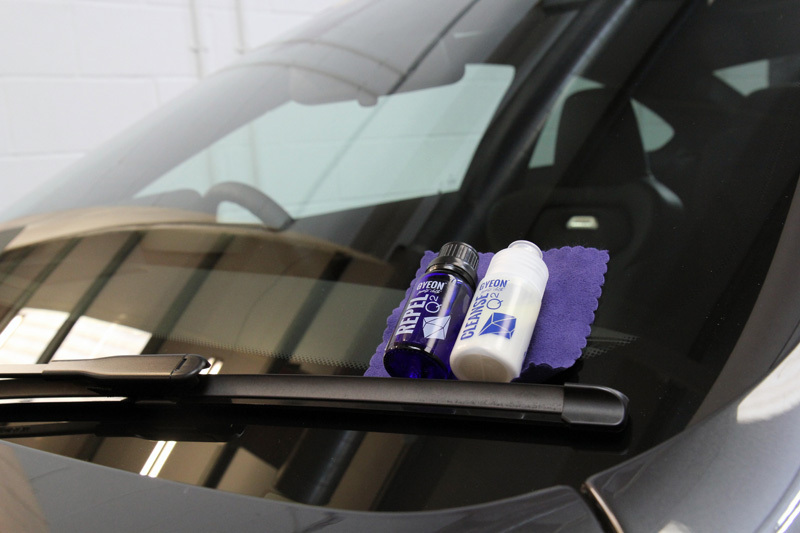 Having recently purchased it from his local BMW dealership the customer booked the car in for a New Car Protection Package, to include the paintwork, wheels, glass and interior. GYEON was founded by self-confessed petrol heads and car care enthusiasts, Robert and Jeremy, in South Korea. Driven to develop the very best in protection they developed a system which they named Q2 Mohs+. This system is composed of a nano-ceramic sealant, Q2 Mohs which is designed to be layered to add tangible thickness and protection to the underlying substrate. 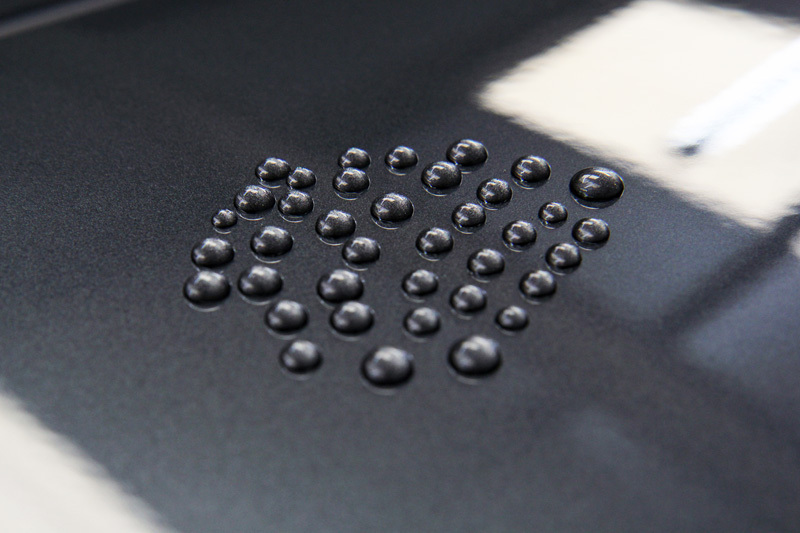 The final layer is Q2 Phobic, a highly hydrophobic coating that encourages water to roll in to beads and disperse from the surface, carrying contamination with it. The combined effect is a scratch resistant, self-cleaning coating with a high gloss shine. Perfect for the enthusiast who doesn’t have a lot of time to devote to keeping their car looking clean and shiny every weekend. 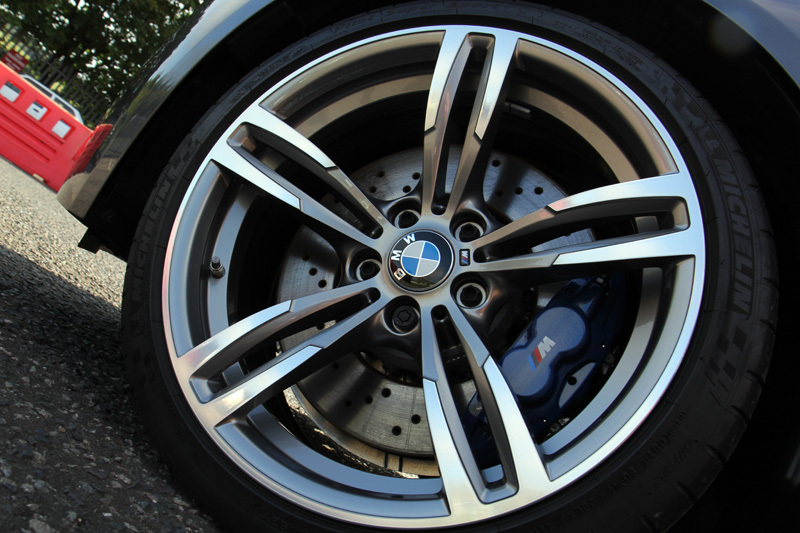 Initially the M4 was decontaminated with Q2M Iron, a ferrous contamination remover to dislodge particles of iron that may have collected on the surface of the vehicle during transit from the factory to the dealership. Then it was treated with Q2M Tar, an adhesive remover designed to remove any traces of protective transportation wax, tree sap and road tar. Then the vehicle was degreased with an all-purpose cleaner solution before being pre-cleaned with Ultimate Snow Foam. This high foaming product lifts larger particles of dirt and grit away from the surface of the vehicle, allowing it to be rinsed away without the need for scrubbing at the paintwork. This minimises the chances of incurring scratches during the main wash process, removing sharper edged contamination before a wash mitt is placed against the surface of the paint. Thoroughly decontaminated the M4 was then washed using the Two-Bucket Method, Q2M Bathe and an Ulti-Mitt Double Sided Merino Wash Mitt. After rinsing the suds away an Aqua Gleam De-ionising water filter was connected to the hose to give a final, pure water rinse. The M4 was then dried and brought inside the studio for inspection under high intensity lighting. 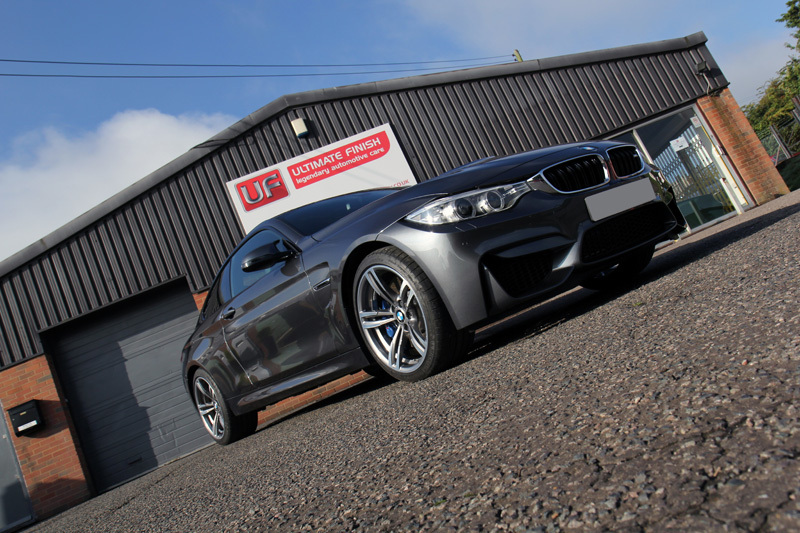 This M4 was in perfect condition, so after a light polish by hand using PolishAngel Esclate Lotion the bodywork, trim, plastics and wheels were cleansed using Q2M Prep. 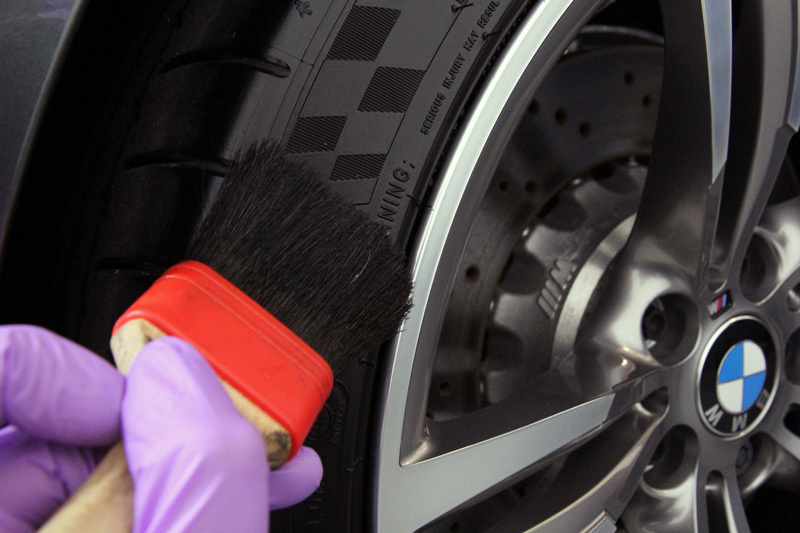 This removes traces of polish residue to allow the sealant to form the highest possible number of bonds – this ensures maximum performance and longevity. 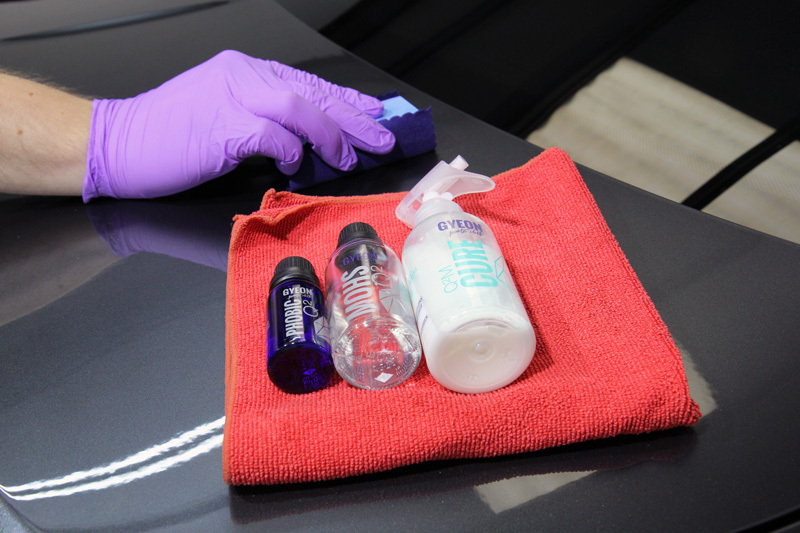 GYEON Q2 Mohs is applied using a suede applicator cloth wrapped around a hard foam block, making it easier for the detailer to main a firm grip and apply the product in even layers and working one panel at a time. After leaving the initial layer to cure for three or four minutes, the surface is then buffed lightly and checked for smears before moving on to the next panel. This process is continued around each panel, on the trim and on the headlamp and tail light covers. After allowing the layer to cure for one hour the whole car was then coated with a second layer. 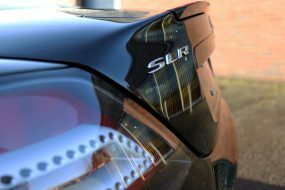 In total, Q2 Mohs adds up to an additional 5H of hardness to the existing lacquer, making it extremely resistant to swirls and virtually impervious to harsh chemicals such as those found in some car cleaning products, as well as acid rain fallout. Finally after allowing a further 4 hours of curing time the whole car was overcoated with Q2 Phobic to further enhance the self-cleaning properties. 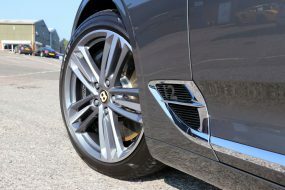 The wheels and exhaust tips were treated with Q2 Rim and the layer was allowed to harden for an hour before a second coat was applied. As with Q2 Mohs, Q2 Rim provides comprehensive resistance to wash chemicals as well as brake dust build up. The heat resistant capacity of Q2 Rim makes it ideal for surfaces subjected to high temperatures. It leaves an amazing shine on the lacquered metal finish too! Whilst Q2 Mohs was curing attention turned to the other surfaces of the car. First the exterior glass was pre-cleaned with Q2 Cleanse to remove any residues from the surface, before a layer of Q2 View was applied. 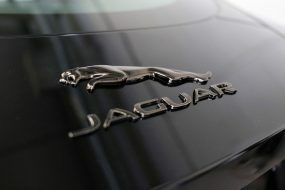 This forms a hydrophobic barrier which repels water making driving easier and less tiring during bad weather conditions. It also prevents ice and snow from bonding as readily with the treated surface, making the morning start much easier on frosty winter mornings. The interior glass was treated with Q2 AntiFog. This hydrophilic (water-loving) coating actually prevents water from condensing when the atmosphere contacts the glass – inhibiting the formation of that irritating mist layer on the inside of the glass on cold mornings. The interior leather was treated with GYEON Q2 Leather Coat, an abrasion resistant, hydrophobic sealant which inhibits dye transfer, stains from liquid spills and protects from UV fade. Q2 Leather Coat leaves a smooth, uncoated feel to the surface of the leather, so is naturally dust repellent, keeping leather feeling and looking ‘as new’ for longer. Q2 Phobic. 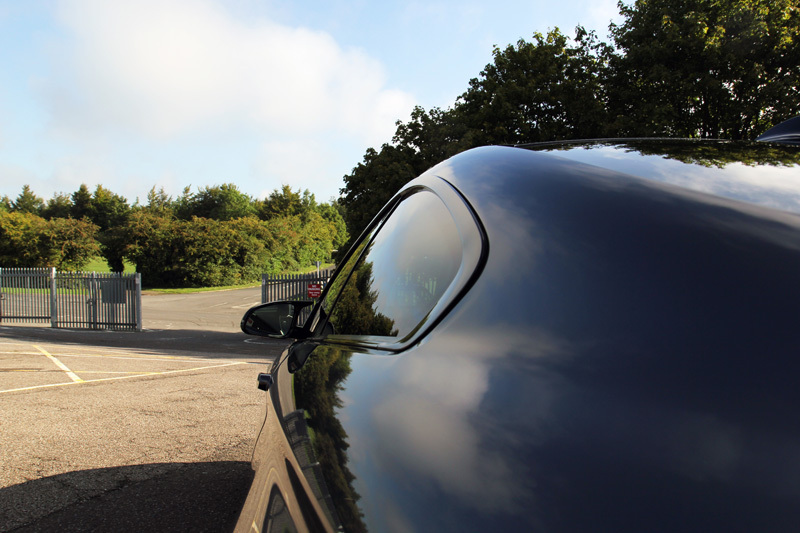 This final layer focuses on the improving the hydrophobic properties, provides an exceptional gloss finish, slick to the touch and brings out the metallic flake in the paint. 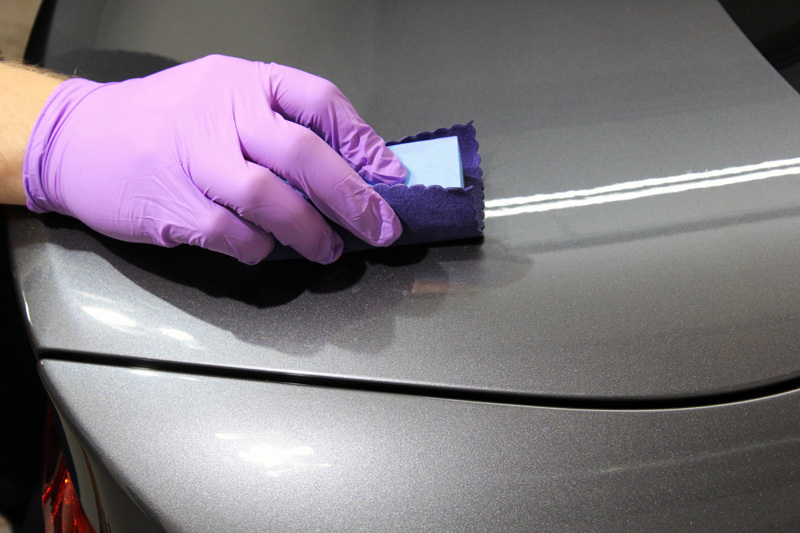 To protect the layers during the full curing process, Q2M Cure is applied. 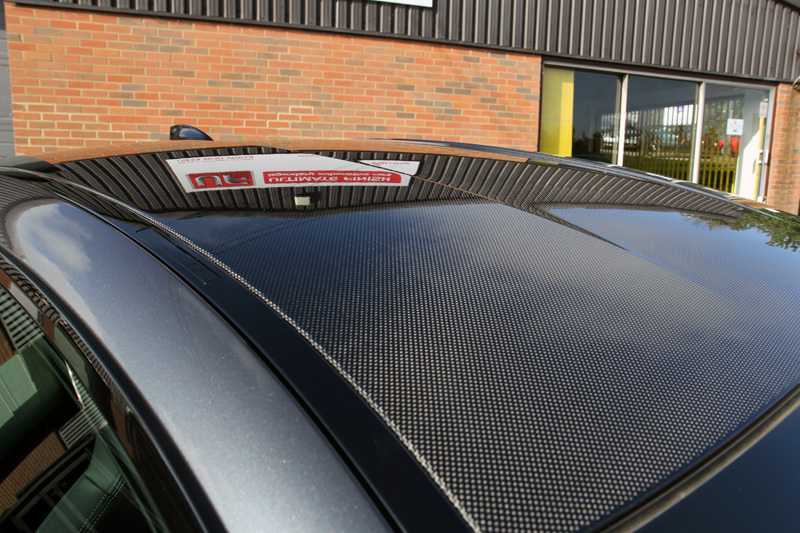 This provides protection from the elements allowing the vehicle to be driven after the initial twenty four hour curing period. The final result is truly stunning. 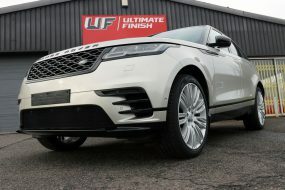 To complete the look, the tyres were dressed with Q2 Tire, a spray-on dressing which can be worked into the rubber using a Swissvax Tyre Brush to give a long lasting, natural satin sheen. The customer was impressed with the finish, which was almost as dramatic as the sound as he drove away, dynamically! Interested in reading more from Robert and Jeremy, founders of GYEON? Read our interview with Jeremy.